There's no one left on YouTube. There's only MSM channels and professional DIY like Coyote Wild, What's Inside and things like Linus Tech (at least for now). It's all commercial. 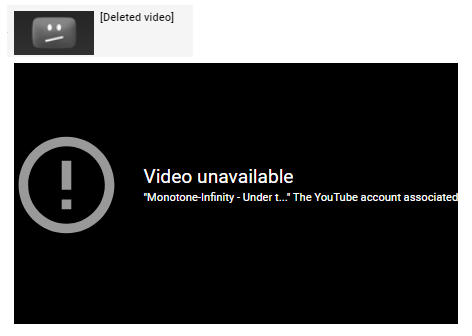 Meme vids, gaming and home cooking are being removed on a daily basis. Dtube didn't quite work out. There isn't any real audience on there aside people talking crypto. There isn't even a real way to manage videos on your channel. I'm convinced Dtube simply won't fly. Dlive is having some of its own issues as well. I did have successful streaming, up until they switched over to the Lino network. All my replays are now broken. All that progress, gone. I have decided to finally settle over at Bitchute. If Alex Jones is having success there, then there should be no problem for a regular Joe like myself (who basically makes weird mashups called YouTube Poop). I don't see Palmolive filing some lawsuit against my parodies of Dr. Rabbit over there. YouTube in itself doesn't quite handle parody law very well.. They don't have a human staff. There wasn't even an option for me to appeal. I predict all the legal BS is going to be absent from my experience over at Bitchute since I am very well within the parody law bracket. The show must go on! Izlude signing out. Enjoy the show.